The ‘gaming backlog’ is a concept almost every gamer will be familiar with - a huge pile (possibly digital) of games that you have amassed, but have no hope of ever playing your way through. 2015 saw a slew of releases that each required dozens if not hundreds of hours of play time, leading to the question of how on Earth we’re supposed to play all these bloody enormous games. At the same time, games are cheaper than they’ve ever been thanks to cutthroat competition among internet retailers, digital distribution, Steam sales and the enormous secondhand market. It’s no wonder that we are developing a bit of a backlog. But at what point does a backlog cross over into obsession? And could all these unplayed games be having some kind of malign psychological effect, as they sit there glaring at you from the shelf and screaming to be played? Even worse, what if your backlog anxiety is revealing some feared, fundamental truth at the core of your very being? But first, some good news: it turns out that your gaming backlog isn’t your fault. In general, a new release costs roughly the same as a brand new game did 20 years ago at between £40 and £50, meaning that games are about 25% cheaper once you account for inflation - and that’s before any big online discounts. And of course, if you wait around for a few months, the price is almost certain to plummet. They are temptingly cheap. But why do people buy more and more games when they don’t have time to play the ones they already own? Are we simply weak willed? Well, not necessarily… we might not have a choice. Companies nowadays employ some seriously intricate sales strategies that essentially reach straight into our subconscious lizard brains and squeeze them until we make a purchase. It’s kind of depressing to think of ourselves as nothing more than rats slapping a lever. But it’s also a good example of how we actually have much less control over our actions than we think we have. In fact, we have a terrifyingly loose grip on reality. In The Heretics, Will Storr presents the evidence that: “The world that you experience as objectively real is your own personal model of reality, and your brain tends to assume that everything new that you experience adheres to this model.” This internal model, whether it be right wing or left wing, radical or conservative, gamer or non-gamer, is set at an early age, and your brain will sift through incoming information for any evidence that confirms your internal model and will ignore the rest - a phenomenon known as ‘confirmation bias’. Essentially, your brain lies to you about the nature of reality. And if your brain can’t be trusted to reliably tell you what’s actually happening outside your head, what hope do you have against the mighty selling machines of the capitalist world? Stocking up on games during a sale is less a case of weak will and more a case of your brain bypassing objective reality and convincing you that YOU NEED THESE THINGS. Tap, tap, tap, tap, tap, tap goes the checkout lever, and all the while the pleasure centres of the brain light up. By this point, you’re either feeling better because your huge gaming backlog is clearly not your fault, or worse because you’ve realised that the world around you is nothing but a lie and you’re no better than a rat pressing a lever in a cage. But although we’ve established that we all have a normal tendency to press that pleasure lever (i.e., the ‘buy’ button) more than we probably should, at what point does this compulsion flip over into something pathological? At one point does simple games collecting become ‘unhealthy’ hoarding? You may have looked at pictures of a collector’s basement, stuffed to bursting with thousands upon thousands of old games and thought: “Wow, they’ve got a problem.” But medically speaking, it’s unlikely that they have. You might question the wisdom of paying exorbitant amounts of money for rare, often terrible games in order to complete a collection, but this is actually not a sign of mental ill health. The Diagnostic and Statistical Manual of Mental Disorders 5 (DSM-5), the authority on mental-illness definitions) does not recognise collecting as a symptom of a mental disorder. 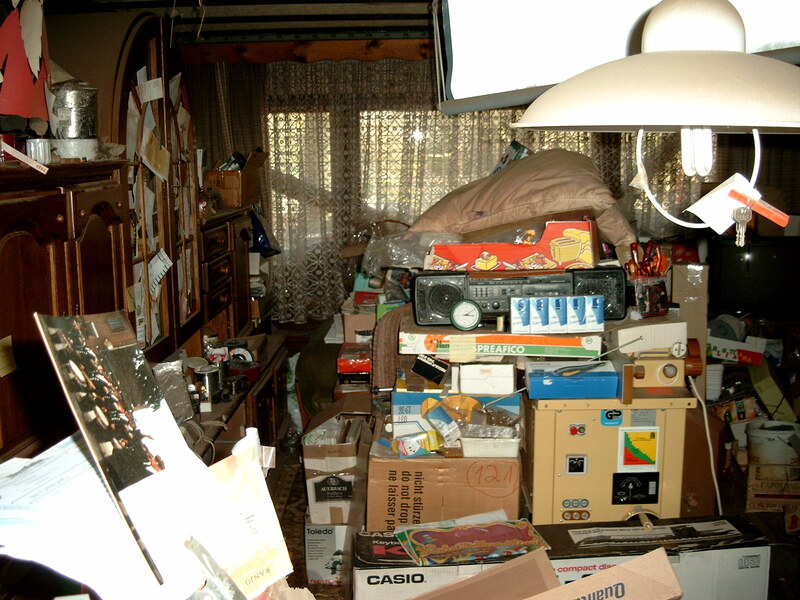 But it does recognise ‘hoarding disorder’, which is characterised by a “persistent difficulty discarding or parting with possessions, regardless of their actual value” that “results in the accumulation of possessions that congest and clutter active living areas” and “causes clinically significant distress or impairment in social, occupational, or other important areas of functioning”. So basically, collecting games isn’t a problem, but if you find that you absolutely can’t part with any of them - and if your house is dangerously full of teetering piles of old newspapers and out-of-date food tins that you similarly can’t part with, and you can no longer get to your bed because of them - then you might have an issue. You could also argue that collectors are a separate breed from people who simply have a huge backlog of unplayed games - often, serious collectors will cheerfully admit to having never played a significant chunk of their games, because it’s the collection as a whole that matters to them rather than the games in themselves. The pleasure comes from filling the gaps in the collection rather than actually playing the games. For backloggers, however, the very sight of all their unplayed titles can be a source of painful anxiety. How do you feel when you look at your backlog shelf? Perhaps pride: a sense that you have an enviable collection. buying too much. Or perhaps it’s a sense of palpable unease and discomfort: when the hell are you going to find the time to play through all of these? This latter feeling of anxiety is hardly unique to gamers. Book lovers have been going through the same thing for hundreds of years. In fact, the Japanese have a word - tsundoku - for buying books and not reading them. All of these unread tomes can combine to create their own sort of mocking tyranny. Will Self describes the feeling well in The New Statesman: “...the idea of all those unread books has become a screaming torment. Even the most innocuous of local libraries feels to me like Borges’s library of Babel, with its infinite number of texts.” He grew up under the illusion - now shattered - that he might one day be able to read “all that truly mattered”, even if he is unable to read everything, like Coleridge is said to have done. This latter part is referring to the oft-repeated but erroneous fact that the poet Samuel Taylor Coleridge was the last person to have read every book - by the time of his death in 1834 there were simply too many books for one person to read in their lifetime. All nonsense, of course: in fact, within decades of the invention of the printing press in the Middle Ages, there were vastly more printed words in circulation than could possibly be read by one person. Video games have been around for approximately four decades, and a similarly hopeless situation has already developed - there are already vastly more games than one person can play. More to the point, there are vastly more GOOD games than one person can play. Likewise, having lots of unplayed games is an indication that you have a good knowledge of which ones are worth purchasing. But although it may be flattering to think of your backlog as indicative of superior gaming knowledge, it doesn’t explain away that lingering sense of anxiety over it. Assuming your anxiety is confined to the backlog and not part of a larger issue, what is that feeling saying about you? If, like me, you’ve ever used HowLongToBeat.com to tot up the amount of time it would take to complete your backlog, you will probably have come away dismayed at the many hundreds of hours it would take to complete even just the bare-bones campaigns of the unplayed games on your shelf. You may kid yourself that you’re saving some of these games for your retirement, but we all know that this will never happen - for a start, there will be thousands more games released between now and then, many of which will also end up being bought and never played. Even playing all of the good games that get released in one year is an impossible task - there simply isn’t the time. The truth is that you will never play through your shelf of unplayed games. And the fact that you think that you might is what is causing the anxiety when you look at that shelf, digital or otherwise. And the reason that you think you can still play through them is because you have yet to accept that death is inevitable. We all know that we are going to die. Everyone dies. Your partner will die. Your family will die. Everyone you have ever known will die. And you will die. This is an uncomfortable, but true, fact. We spend most of our lives running away from this fact, refusing to deal with it or even acknowledge it, except in circumstances in which it is utterly inescapable. Yet that fear of death is still there, even if we don’t acknowledge it, and it seeps out every now and then - sometimes in the form of anxiety about the future. Anxiety in its most basic definition is worrying about something we cannot control. And death is the ultimate in terms of things we cannot control. Of course, the flip side to this is that if we cannot control it, there is absolutely no reason to worry about it. There is nothing you can do about it, so by definition any time spent worrying is time wasted. In the end, perhaps the aim is to look at your unplayed games and feel not shame, not pride, not anxiety, but wonder and excitement at the paths and possibilities contained within - with an acceptance that some of those paths will be closed to you forever. And I am never going to finish all of my unplayed games. Top image credit: Tomer Gabel.